I will reveal to you how Formula 1 drivers and Hollywood stars negotiate their secret tax deals with the authorities of the Canton of residence. The good thing is, you do not have to be a movie star to enjoy the benefits of Swiss Lump Sum Taxation. You save millions in taxes because you are not taxed on income and wealth, but only on the annual cost of living. Save up to 95% of your annual taxes. Every year, you will save between several 100’000 EUR to 100’000’000 EUR and more. This attractive taxation regime is unique to Switzerland. In addition, your income and your wealth remain a private matter – 100% privacy is guaranteed by the Swiss authorities. The Swiss authorities are not concerned with your income and wealth. It is your yearly living expenses that will determine your Lump Sum Taxation and your final tax bill. Consequently Swiss Lump Sum Taxation is also known as Expenditure-based Taxation. Everything you need to know about the Lump Sum Taxation in Switzerland in under 9 min. International Tax Lawyer Enzo Caputo will explain it in simple words. Best rated Law Firm in Switzerland. Your #1 Law Firm for International Private Banking. I had occasion, on the recommendation of a colleague, to consult with Mr. Caputo a couple of weeks ago with respect to relocating to Switzerland. This was a preliminary meeting and matters of flat-taxation and property investment were discussed in detail. I came away from this meeting feeling very comfortable with this firm and the advice I was given and I will, down the road, utilize their services. Just WOW!! Amazing Lawyer! BEST of the BEST!! Love his approach… He knows what he is doing. Smart, Clever and everything in between… everything you are looking for… so if you want a Lawyer… representing you in all circumstances… Mr. Caputo is the Answer! Interesting videos, not ordinary ways to solve the client problems, great attitude toward their clientele. Enzo and his team have everything the client needs to achieve results. Mr. Caputo and his partners would work hard for you and stay with you until your problem would be resolved! I highly recommend Caputo and partners for your legal needs. (Translated by Google) The best lawyer for international oversight in combination with European immigration law. Mr Enzo solved my problem with great skill and speed. Super indicated. Income Tax in Switzerland for Foreigners? Entrepreneur moves from the USA to Canton Zug. He saves more than CHF 3’651’400 per year in taxes. Lump Sum Taxation in Switzerland – Apartment/House buying or leasing? How to reduce tax in Switzerland as a Non-EU citizen? How to avoid complications without exposing the Tax Ruling at risk? What can put your Tax Ruling at risk? Why is Switzerland the dream destination of many wealthy families? What are successful, globally active entrepreneurs looking for? If you do not meet the requirements for the Lump Sum Taxation in Switzerland – No problem. We have battle-proven alternative solutions. There are attractive tax-saving models that could be suitable for you, depending on your specific situation. Call +41 44 212 4404 and make an appointment for a strategy-session with Enzo Caputo. Or send us your best phone number via ✉Mail to fix the appointment for the strategy-session. Based on many years of experience, we negotiate the best lump sum taxation contract for you. The procedure usually takes 4-6 weeks. In case of urgency, we offer you a “Fast Track” procedure. It only takes 2 – 3 weeks, including permanent residence permit issued by the Swiss Immigration Authorities. The days of completing 50-page tax returns are definitely over. The tax deal negotiated for you – called “the Tax Ruling” – applies to all subsequent tax years. The Tax Ruling replaces all tax returns until you leave Switzerland. The tax calculation will be based on the cost of your annual living expenses or your annual rent multiplied by a factor of 7. The higher amount is ultimately used for taxation. The tax agency does not want to know how big your income is. Neither income nor wealth will affect your tax bill. If yachts, helicopters and racehorses drive up the cost of your living expenses, your tax bill will increase accordingly. We are happy to assist you in putting together the tax-relevant expenditures. Your bank account with a Swiss bank is a private affair. It is not taxable and not reportable. If your Swiss bank account at the old residence was kept as a secret, it will be legalized in one go with the move to Switzerland. You no longer have to deal with the Automatic Exchange of Information (AEOI) and the Common Reporting Standard (CRS). These OECD treaties and rules are overridden for you in one fell swoop. Nobody cares how much money you have on your account. As a resident, you benefit from Swiss banking secrecy. Swiss banking secrecy is a significant part of the concept of privacy among the Swiss population. Swiss banking secrecy is considered as a constitutional right to privacy. For many citizens of the Russian Federation, the negative consequences in connection with the AEOI & CRS are the main reasons for moving to Switzerland permanently. You don’t need complex offshore-structures anymore. Your risky tax loopholes with offshore companies will become irrelevant. Your doubts as to whether a specific offshore structure is considered to be legal or illegal are definitely gone. Constant worries in connection with doubtful offshore structures are definitely eliminated with your relocation to Switzerland. Every year, you will pay the agreed Lump Sum Tax. You know exactly how much tax – or rather how little taxes – you will pay. You can be 100% sure of the exact amount of tax you will pay every year. Since 1862, Switzerland is offering tax rulings that work. Finally, you will have the peace of mind you deserve. You will enjoy legal status that you can count on. Most of the Cantons (except Appenzell, Neuchâtel and Vaud) have abolished gift and inheritance tax if the spouse or direct descendants are the beneficiaries. If distant relatives are the beneficiaries, half of the Cantons will tax you very moderately compared to the European Union. Are Capital Gains taxed in Switzerland? In Switzerland there is no capital gains tax for natural persons. The German industrialist Theo Müller, founder of Müller-Milch, had a problem with gift tax in Germany. For this reason, he moved away from Germany and now lives in Switzerland. Switzerland has the lowest VAT rate of 7.7% in Europe. VAT in Europe varies from 17% to 27%. As an entrepreneur in the international market, you have to compete with other companies for market share and that costs money. It’s not always about earning more but having more of the existing revenue to reinvest in the business. If you save millions in taxes, you can invest better in your business. That brings you competitive advantages. Your competitors will envy you. The widespread public debt with empty coffers in many countries creates uncertainty. It’s a bad omen. More and more globally active, wealthy and successful business people are buying a new domicile (known as a “Golden Visa”) or a second nationality with an additional passport through a “Citizenship by Investment Program”. The new business with Golden Visa and Citizenship by Investment is growing tremendously. By moving to Switzerland you have acquired an insurance policy and prepared a plan B for bad times. In the last two years, the number of transactions with a “Second Passport” have exploded. According to Wikipedia, passports totalling 2 billion USD in investments were acquired last year. The world is becoming unstable. The numbers confirm this trend. You can also start massively saving taxes, as rock star Phil Collins, football star Michel Platini, Formula 1 driver Michael Schumacher, Carl Hamilton, Kimi Raik Önen, Sebastian Vettel, Tina Turner, Diana Ross, James Blunt and many others do. Move to Switzerland before the Lump Sum Taxation opportunity is abolished in more Cantons. The Cantons Zurich, Basel Land, Basel Stadt, Schaffhausen and Appenzell Ausserrhoden have already abolished the Lump Sum Taxation Regime. Other Cantons could follow this example. In the European Union, the Exit Tax will be tightened. Secure your hard-earned money as long you have the legal opportunity to do so. With the move to Switzerland, you will be taxed on your yearly cost of living and thus save a lot of money. The money save you can better invest in your own company. So you have the certainty that it is spent wisely. You do not have to declare income or wealth. Your annual cost of living is considered as your taxable income. Your real income exceeds the cost of living. In the eyes of the Swiss tax authorities, the cost of living expenses per year are treated as if these costs were the taxable income. Since the cost of living is always lower than income, taxation is correspondingly lower. The cost of living becomes the substitute (in the jargon, the “surrogate”) for the taxable income. As a successful businessman, you must be willing to be taxed on a surrogate income equal to 7 times annual rent or the annual cost of living. The higher result defines the taxable income. The calculated income (tax surrogate) is taxed at reasonable rates. If we agree on a life expense of CHF 600,000 with the Canton of Zug, you pay the ordinary rate for the Canton of Zug of 22.89% of income tax. Your effective income remains your own secret. You should have a wealth of at least CHF 10 million. The tax authority multiplies the income calculated by your cost of living by a factor of 20. It thus defines your taxable wealth. The taxable wealth is also a tax surrogate. It has nothing to do with real wealth. 4. Income Tax in Switzerland for Foreigners? Make millions in tax savings with the Swiss Lump Sum Taxation Regime (also known as the “Switzerland Forfait System” or “Expenditure-based Taxation”). The income is not taxed. Instead, there is an expenditure-based taxation. Many have turned their backs on Monaco, despite paying zero taxes in Monaco. Modern Formula 1 racers have to train regularly today. If they want to win the Grand Prix, they have to do sports every day and keep fit. In Monaco, they were persecuted while training by paparazzi. They had to train in the constant company of bodyguards. In Switzerland, you can practice undisturbed in the immediate surroundings and in the great outdoors. Highest discretion and respect for privacy is firmly anchored in Swiss culture. Although low crime rates and a high quality of life may – unlike Monaco – cost something, the lion’s share remains untaxed, as can easily be seen from the following calculation. 5. Entrepreneur moves from the USA to Canton Zug. He saves more than CHF 3’651’400 per year in taxes. Mr. A is an Entrepreneur who moved from the USA to Switzerland. In the USA he paid an income tax of CHF 3’960’000 (Income Tax of 39,6% for 2017 in the USA, No Wealth Tax in the USA). Today, he lives in the city of Zug in the Canton of Zug with the benefits of the Swiss Lump Sum Taxation. In Zug he is paying 22,86% on the yearly living expenses of 1’000’000. As a Swiss Taxpayer with Lump Sum Taxation he pays CHF 308’600 = 228’600 Income Tax + 80’000 Wealth Tax (0,40%). He is saving CHF 3’651’400 CHF each year (3’960’000 – 228’600 – 80’000 = 3’651’400). Swiss Lump Sum Taxation is based on Yearly Living Expenses instead of Yearly Income. The calculation of the lump sum tax is based on the much lower Yearly Living Expenses of CHF 1’000’000 instead of the effective Yearly Income of 10’000’000. To calculate the surrogate wealth for taxation, simply multiply the surrogate income by a factor of 20. Your effective wealth is irrelevant to taxation. Total Income Tax & Wealth Tax in Zug, calculated for the determination of total tax (federal, cantonal and municipality tax). Mr. A will receive a total tax bill of CHF 308‘600 based on Expenditure-based Taxation (Swiss Lump Sum Taxation) per year. In the USA, he pays a tax of CHF 3‘960‘000 per year (39,6% of CHF 10‘000‘000, his yearly Income). As a normal taxpayer in Zug his income of CHF 10’000’000 triggers a tax bill of CHF 2’286’000 Income Tax (no lump-sum taxation, ordinary taxation) + 400’000 Wealth Tax. He would be charged with the maximum tax rate for peak incomes in Zug of 22.86% for the federal government, the canton and the municipality and a Wealth Tax of 0,40% on his wealth of CHF 100’000’000. ► Alert for US Persons! Before moving to Switzerland our client invested 2,5 million EUR in real estate in Cyprus taking part to the Cyprus Citizenship by Investment Program. He entered in Switzerland as a Citizen of the EU taking benefit from the Swiss tax privilege granted to EU Citizens. After becoming the Swiss residence permit Type B for a permanent residence in Switzerland he accomplished the relinquishment procedure for his USA Citizenship. To stop his tax liabilities from the USA he renounced to his USA citizenship. Otherwise, he would be still subject to the US tax liabilities. US citizens living outside the USA must file a Report of Foreign Bank and Financial Accounts, known as FBAR Filing obligation. CHF 128‘560 (with ordinary taxation based on CHF 400‘000 yearly Income and CHF 10’000’000 Wealth). The wealth tax in Spain has been introduced again after the financial crisis. The calculation in the chart is just an estimate due to some different options for deductions. Anyone who moves to Switzerland with the above income and wealth from Germany, Greece, the UK and Spain should choose ordinary taxation and not Lump Sum Taxation. The tax savings with ordinary taxation alone is also worthwhile in relation to the high tax countries in Europe. If the level of the living expenses and the level of income are similar, the option for the ordinary taxation can be more convenient. We will calculate the tax consequences tailor-made to your specific situation. Each municipality and each Canton trigger their own tax consequences. Our advice is a total consultation that does not just define the tax consequences. Rather, we strive to increase your quality of life by providing tailor-made advice and access to our relationship network. We know the local infrastructure and maintain personal relationships with the Cantonal chief officials. Is Switzerland a tax-free country? It’s definitely not. Ordinary taxation in the Canton of Zug amounts to 22.86% for the federal government, Canton and municipality. Income tax amounts to 22.86% of CHF 650’000 (living expenses = surrogate income) with Lump Sum Taxation, while with ordinary taxation CHF 1’314’400 would be payable. This results in an income tax of CHF 148’590. The wealth tax is ~ 0.40%. This results in a property tax of 52’000 CHF. Thanks to Lump Sum Taxation in Switzerland, the entrepreneur from Slovenia has a total annual tax of only CHF 200’590. In Slovenia, he has to pay 50% of his CHF 4 million, which amounts to an income tax of CHF 2 million. In Switzerland, he pays about 10% (CHF 200,590) of the taxes he previously paid in Slovenia. His tax burden fell from CHF 2’150’000 to CHF 200,590 only. Each year, he will save CHF 1’949’410. He is in a position to invest in his company, instead of surrendering to the Slovenian high-tax state. Due to the political instability in many countries there are more clients relocating to Europe for other than tax reasons. In the Kingdom of Saudi Arabia, there is zero taxation. Many families in the Middle East are concerned to remain blocked in their country of origin in case of an emergency. A visa request with a Saudi Arabia passport is time-consuming. They are looking for a Plan B in case of a political turmoil at home who works with immediate effect. They don’t need a permanent residence offered, for example, by the Swiss lump Sum Taxation or the Italian Golden Visa Program with Flat Tax benefit of EUR 100’000. They don’t like to stay more than 182 days in Italy or Switzerland. Both programs in Switzerland and Italy require a permanent residence. Spain, Portugal, Malta and Cyprus are offering a Golden Visa without the requirement of physical residence. One of the last mentioned four programs are perfect for clients for the Middle East looking for a Plan B residence in case of political unrest. In case they are forced to leave the country overnight, they will have the perfect Golden Visa ready and to jump in the next aircraft or private jet moving to Europe in a more secure country. The Golden Visa Programs and the Citizenship by Investment Programs are exposed to the pressures of the EU bureaucrats in Brussel. Frequent changes with the requirements, terms and conditions are not evitable. We are following the last developments of the Golden Visa Industry very closely. Therefore, give us a call to check the last developments on the terms and conditions of the relevant programs. But we also help with finding accommodation and advising you on buying a home, and in the selection and search of suitable private schools and clinics. Large law firms and international auditing firms have a lot of staff changes. Excellent personal relationships with chief officials of the tax authorities cannot be maintained if the staff changes constantly. We offer 360°-degree consultation & support according to the One Stop Shop principle. The lump sum tax is calculated on the basis of global living costs per year. In the following paragraph, we have created a table with items to calculate the cost of living. 9.3 Lump Sum Taxation in Switzerland – Apartment/House buying or leasing? If you buy a house and therefore pay no rent, a surrogate rent is calculated based on the real estate value. As usual in the market, purchase and rental prices are higher in the Cantons with low tax. Before the purchase/rental decision, you should think carefully in which municipality you settle within the Canton. Our long-standing cooperation with customers from all over the world has shown that it is not only the ultimate lowest tax rate of a municipality that should be the sole purchase/rental criterion. Experience has shown that it is much more important – in the long term – to be able to integrate socially and to find an optimal quality of life on the ground for all family members. Based on our 30 years of experience, we have built up a large network of relationships in the real estate industry. We are able to make the purchase and rental process of your new property fast and uncomplicated for you. In addition, you benefit from interesting off-market properties in extremely sought-after and very exclusive locations. The Federal Tax Administration (https://www.estv.admin.ch/estv/en/home.html) recently published a Directive No. 44 dated 24 of July 2018. The income for candidates filing for Lump Sum Taxation is set at least at CHF 400‘000. If the cost of living for a year or the annual rent multiplied by a factor of 7 is less than CHF 400,000, the income at Federal level is nevertheless set at a minimum of CHF 400’000. The Cantons are still autonomous in determining taxation. In accordance with the federalist structure of Switzerland each Canton has defined its own “living expenses” in order to determine the income for the calculation of cantonal taxes (including municipal tax). To make it easier for you to select a tax-efficient Canton, we have created a table that shows the minimum income in all Cantons. What happens when you move to a Canton that does not offer lump-sum taxation? 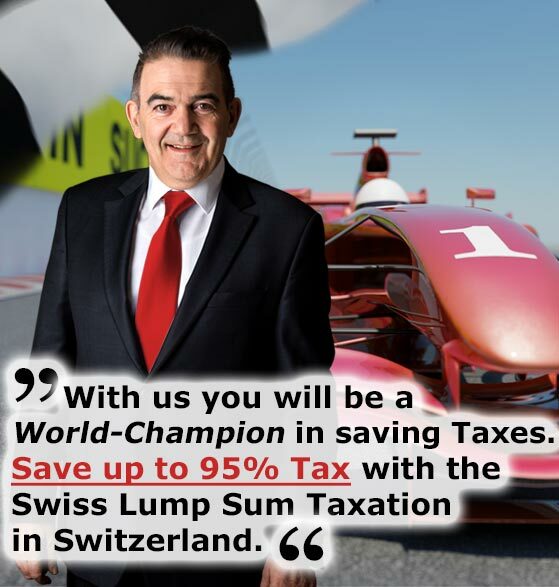 Mr. A. is taxed in Zug with the benefits of Lump Sum Taxation. After 2 years, he moves from the Canton of Zug to the city of Zurich. In Zurich, you pay the ordinary municipality tax and Cantonal tax, as the Canton of Zurich has abolished the Lump Sum Taxation Regime. However, you still have the right to all the benefits of Lump Sum Taxation with respect to Federal Tax. You pay the identical federal tax as you paid in the Canton of Zug. On the other hand, you are subject to ordinary taxation for the assessment of the Cantonal and municipality taxes in Zurich. The Tax Ruling was agreed with the Canton of Zug and not with the Canton of Zurich. Therefore, the Tax Ruling is not valid for taxation in Zurich. 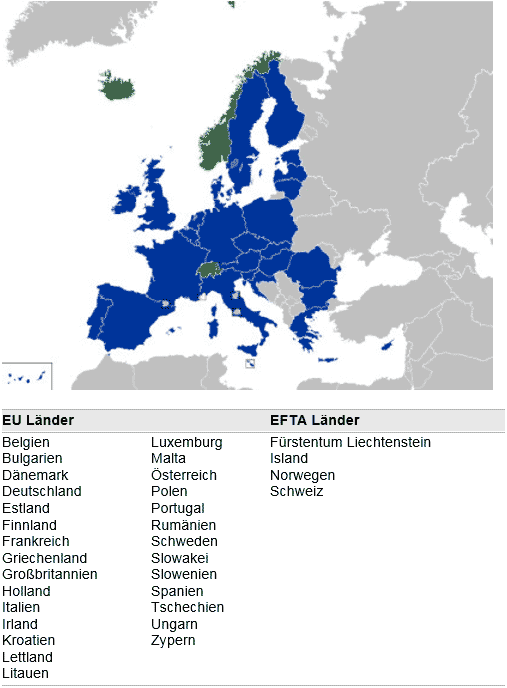 Who are the EFTA Nations? The European Free Trade Association (EFTA) is a supranational organisation promoting free trade and economic integration. EFTA consists of the following Member States: Iceland, Liechtenstein, Norway and Switzerland. If you do not have a European passport and you do not have any personal connections with Switzerland, you may still settle, but it will be more expensive. The process is complex. The State Secretariat for Migration in Bern (https://www.sem.admin.ch/sem/de/home/ueberuns/kontakt.html) must grant an additional permit. Consequently, the Canton must confirm “significant Cantonal fiscal interests”. The Canton checks on its own initiative whether personal and cultural connections exist with Switzerland (which, of course, everyone claims even if it is only their bank account at UBS). A bank account relationship is not sufficient to justify “existing personal connections” to Switzerland. The candidates must be prepared accordingly for interviews with the authorities. Candidates from foreign cultures must show enough motivation to adapt to Swiss culture and society. Every case is different. The authorities are checking carefully. An apparent residence on paper is not enough. The authorities must be convinced that the new centre of life is in Switzerland. This means that the taxpayer is physically in Switzerland for at least 182 days a year. In general, the Cantons require that a tax bill of at least CHF 500,000 up to CHF 1 million be paid to the Cantons. Each Cantonal chief official will interpret the tax law according to the current financial needs of the Canton. The more you are willing to pay, the less high will be the requirements. Good advice is absolutely needed here. Questions of legal interpretation of integration, cultural background and willingness to adapt are sensitive questions opening the door to a myriad of arguments. Please inform us in time if you do not have a passport from Europe and would like to settle in Switzerland. The sooner we can intervene, the better the final result (tax ruling) will be. Since “already existing personal and cultural relations” in Switzerland must be demonstrated, we can subscribe you – depending on situation and hobbies – into specifically chosen exclusive clubs or other organisations (tennis club, golf club, yacht club, chamber of commerce, Numismatic Association, Rotary Club, etc). At the time of our submission to the tax authorities, we will be in a comfortable position to be able to document the existing connections to Switzerland. Depending on the source and amount of assets, it pays to apply for a passport in Cyprus through the Citizenship by Investment Program before moving to Switzerland. It will be necessary to calculate the tax impact before entering into what could be an expensive venture. With the Cyprus passport, you become a citizen of the EU. You will save massively. As a non-EU citizen, you pay three to six times as much tax as an EU citizen. EU citizens with a life cost per year of CHF 400’000 – CHF 600’000 pay, depending on the Canton, between CHF 150’000 and CHF 200’000 taxes. Members of the jet set, who maintain an extravagant lifestyle with high costs, quickly come up with much higher taxes. Non-EU citizens must represent a “significant fiscal interest” for the Canton. In other words, a Non-EU citizen never gets away with a tax bill of less than CHF 500,000 per year. Non-EU citizens with moderate living expenses must expect a tax bill of CHF 500’000 up to CHF 1’000’000. This means that a Non-EU citizen has to pay CHF 350’000 to CHF 850’000 more taxes per year than an EU citizen. 12.3. How to reduce tax in Switzerland as a Non-EU citizen? For Non-EU citizens, it pays to buy an EU passport in Cyprus. The passport in Cyprus costs nothing. However, you must make a real estate investment of 2.5 million EUR to get the passport. After 3 years you may disinvest your investment. In addition to Cyprus, passports are also available on attractive terms in Bulgaria, Malta, Hungary, Slovenia, Macedonia, Montenegro or Bulgaria. In Bulgaria, you can buy the passport after a residence of 3 years. The conditions for a Citizenship by Investment Program can change quickly. We will keep you updated. We calculate for you quickly and easily how many taxes you pay where. Give us a call. At the end of 2016, 5046 people were taxed in Switzerland under the Lump Sum Taxation regime. They paid taxes of CHF 767 million in total. 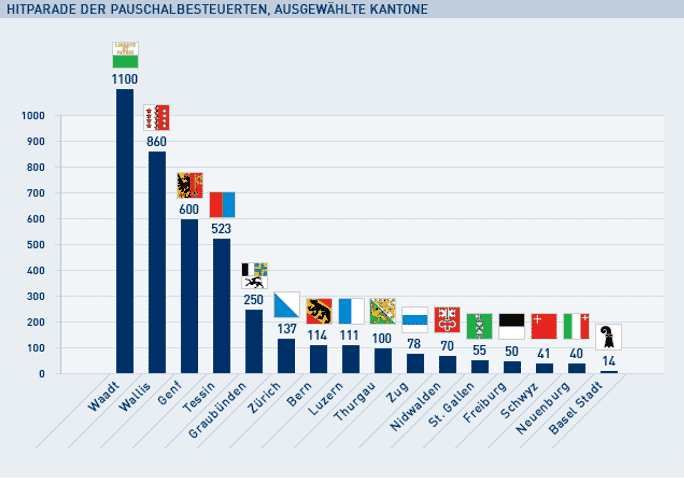 On average, each person paid CHF 152’002 in taxes. The differences are extraordinary. The taxes collected vary from CHF 10’000 to CHF 8 million, depending on the specific situation. Most of the fortunate people concentrate on the region around Lac Leman (Lake Geneva) and Ticino. The Canton of Vaud is the leader with 1’125 people. There are 910 people in Ticino. In Geneva, 638 people reside. Other attractive places are the Canton of Grisons with 235, Bern with 201, Zug with 127 and Lucerne with 114 people who enjoy the benefits of Lump Sum Taxation in Switzerland. For more than 150 years Switzerland has offered the benefits of Lump Sum Taxation to foreign residents. Many of them are celebrities and super wealthy individuals. The Swiss authorities see the taxpayer as a customer and not as a litigant, as is the case in France, Germany or Italy. Taxpayers, consultants and authorities cultivate a culture of trust and transparency in Switzerland. Despite the underlying mutual trust between tax authorities and taxpayers, the calculations are complicated. Great scope for interpretation underpins the whole process. Cultural differences open the door to misunderstandings or distrust. Anyone who expresses himself clumsily, says something wrong, conceals minor offences committed in youthful carelessness or road traffic offences, shows a false document can quickly become embroiled. More intensive clarifications with personal interviews are the result. The Cantonal Tax Administration must involve the Federal Tax Administration in Bern. The process becomes unnecessarily complex and time-consuming. It can even degenerate to the point that you are declared Persona Non Grata, a person undesirable in Switzerland and blacklisted. Which documents do you need to prepare? Depending on the Canton and individual case, additional explanations and documents may be required. The documents must not contain any contradictions that could give rise to inquiries. If you used to be politically active as a student, for example, you must disclose and justify your activities. 15. How to avoid complications without exposing the Tax Ruling at risk? We negotiate for you the most important tax deal of your life with the Swiss authorities, from which you will benefit massively over the years. You have to be transparent with your private history. Otherwise, you sabotage yourself in the initial phase. You must not hide negative points about your resume. There is nothing worse than the authorities discovering contradictions or even lies based on their own research. Such a situation could break the tax deal. Once trust is destroyed, further negotiations are very difficult. In the worst case, it can result in the complete stop of the entire process. Roman Abramovitch stopped his application for a Swiss residence just three weeks after he had officially been registered in the commercial register in London as a Swiss resident. Nobody is exactly clear on the circumstances. Mr. Abramovitch (listed as No. 139 in the Forbes-List) applied for a court injunction in Zurich on his residence application. The Swiss authorities intervened at the highest level to ensure his privacy. The court has forbidden anyone to distribute any information on his application for residence with Lump Sum Taxation. I fully respect the court decision. He did nothing wrong. The example simply shows that the residence procedure with Lump Sum Taxation is a very delicate procedure. The award of a Swiss residence permit is a unique privilege despite how wealthy you are. Compared to other Golden Visa Programs, the Swiss Golden Visa Program has to be considered as the Rolls Royce solution among all other programs of the world. You have to be transparent. You should disclose everything to us. The more we know about your circumstances, the more efficiently we can argue. We will find the right way. We know how to correctly present sensitive issues in the curriculum vitae so that the process of the Swiss Lump Sum Taxation does not become a nightmare. 16. What can put your Tax Ruling at risk? The biggest danger comes from the tax agency in your home country. All obvious ties to the old homeland have to be broken off. Do not leave the old tax authority any grounds to pursue you. It is best to break all connections to the old home and sell your real estate in the home country. Transfer your assets. They should no longer have any assets there that could be confiscated in any proceedings. Take care when visiting relatives. Depending on your country of residence, you may even have to write down in your diary your days spent visiting family. Many tax processes involved the number of days of residence. Keep electricity bills. Such bills can later be useful to prove the place of residence at the new residence. We will gladly advise you on which proofs can be valuable for future tax procedures. Gather all the evidence that documents your new centre of life. These documents can be worth money. We will offer you tailor-made advice based on the country of origin. At first hand, customers from all continents tell us personally how unsettled, scared and threatened they really feel. These customers are normal but wealthy people – successful business people. Thanks to our international relationships, we are able to make current assessments or even predictions about developments. We use this privileged information to your advantage. We develop a tailor-made plan B for our customers – for you. If you would like to discuss your plan B with us and find out your options, write us an via ✉Mail or call us now and book an appointment, directly with me, on the phone or in person: +41 44 212 4404. 17. Why is Switzerland the dream destination of many wealthy families? Tax increases bordering on expropriation have already been officially announced in many countries. Junkie treasuries, bail-ins and rapacious tax agencies threaten your fortune. Spain already taxed bank accounts. Poland, Hungary, Argentina and Portugal have already partially appropriated pension funds. Free movement of capital controls have already been introduced in Iceland, Turkey, Saudi Arabia and Cyprus. Other countries will follow. Internationally resident family members are much more mobile today than they used to be. They depend on a well-functioning international payment system. Every day they have to contend with the compliance departments of the banks and restrictions on the free transfer of capital. Exit Tax is being tightened in Europe in many countries. Some high-tax countries, such as Germany and France, want to adopt the nationality-based US tax system. The tax authorities want to make the transfer of residence to another country less attractive in order to maintain the tax obligations of their citizens for eternity. 18. What are successful, globally active entrepreneurs looking for? The media’s starry-eyed reports about the benefits of the Automatic Exchange of Information (AEOI) and how the AEOI will bring the tax evaders out of circulation and behind bars ignores the enormous disadvantages and the big danger potential of the AEOI. No-one cares when AEOI allows high-risk personal information held in bank account documents to end up in the hands of corrupt civil servants. The AEOI will put many wealthy families at mortal danger. Nobody cares. Much more important is apparently that the criminal tax evaders are prosecuted and presented to the judge. Thanks to the AEOI, the state is well informed about where you have invested your money abroad. The government can force you in the EU to bail out your bank. The AEOI is just the first sign of a dangerous development towards nationalization. The state can use your money in your bank account to make you a shareholder of the bank overnight by virtue of the bail-out law. As a shareholder of an ailing bank, you have a good chance of losing your money. By law, the state can convert your savings into venture capital. Remove your money from the account and take it to a safe Swiss bank before the state forces you to save your ailing bank in the EU and the treasury. Many of our customers have recognized these signs of the times. As an entrepreneur, you know how important timely planning can be. But you do not know exactly how a bespoke plan B for uncertain times should look. We support you in implementing your plan. We do not just help with relocation to Switzerland. Whether acquiring a second citizenship, transferring your residence to another country, opening an account in countries without AEOI, physical gold deposits out of the radar of the banking system, relocation and diversification of assets into safe countries, corporate structures to secure assets, we help in every delicate situation on a tailor-made basis. Every plan B looks different. We’ll show you which options you have and which ones you should implement immediately. Directive No. 44 of 24 July 2018 of the Federal Tax Administration has raised the minimum income for Lump Sum Taxation in Switzerland to CHF 400,000 at the Federal level. At the Cantonal level, the minimum income varies from CHF 400,000 to CHF 600,000 depending on the Canton. Since January 2017, Italy has been offering a uniform Income Flat Tax of EUR 100,000 per year through a new Golden Visa Program. A Golden Visa program offers a residence in a certain country against the payment of a flat tax. All foreign income is covered by the payment of EUR 100’000 lump sum tax in Italy. The Golden Visa Program in Italy works for anyone who would have to pay more than EUR 100,000 tax on ordinary taxation. Since the acquisition of football star Cristiano Ronaldo by Juventus Torino, he has transferred his tax residence to Italy with the Golden Visa Italy. Thanks to Cristiano Ronaldo, the Italian Golden Visa Flat Tax Program has gained in popularity. The Golden Visa Italy program is slightly more tax-efficient than Lump Sum Taxation in Switzerland. Nonetheless, the Swiss Golden Visa remains the best of all Golden Visa programs money can buy. Monaco is one of the last tax havens for wealthy private individuals: no taxes on income, wealth or capital. The costs of living are however are disproportionate. According to the well-known real estate agency Engel & Völkers, an investor from the Middle East has paid EUR 148’000 per square meter for a penthouse with a direct view of the marina. What is saved on taxes goes on the rent. The Golden Visa Italy has been in existence since 2017. It has been heavily targeted by the EU Member States. Italy has created a tax haven for the super-rich, the EU affirms attacking Italy, and contends that the program is unfair. These are the usual assumptions of the OECD. It is not known how long the Golden Visa Italy will last. On one hand, Italy is a member state of the OECD, on the other hand, Italy is offering a typical offshore tax haven product. The European Union has severely criticised the controversial behaviour of the Italian politicians. The Italian Golden Visa Program is under constant political pressure. Interested parties love the Italian lifestyle, but they do not trust the Italian government. There is also no real binding contract (Tax Ruling) with the state, as it is the case in Switzerland. By contrast, Lump Sum Taxation in Switzerland has proven its worth since 1861 and can look back on more than 150 years of history. The Golden Visa Italy is a legislative shot from the hip that first has to prove itself in practice. Legal certainty is guaranteed in Switzerland. The many changes of government in Italy are spreading insecurity. Those who can afford it should opt for Lump Sum Taxation in Switzerland. It costs a little more but guarantees maximum legal certainty and all the advantages of Switzerland. If you are thinking that Lump Sum Taxation Switzerland might be interesting for you, then call now and let’s calculate the tax savings. 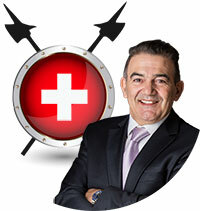 We have helped people from all over the world establish a new home in Switzerland and saving taxes. Our support will not stop after signing the super deal with the Canton. We help you with smart tips in connection with real estate and the other paperwork. Import facilities for Yachts, Helicopters, Private Jet etc. If you would like to discuss your options, write us an via ✉Mail or call us now and book an appointment, directly with me, on the phone or in person: +41 44 212 4404. Why should you choose Caputo & Partners? We are a boutique law firm that specializes in specific areas helping private clients. Caputo & Partners offers unsurpassed personalized service at the highest level. 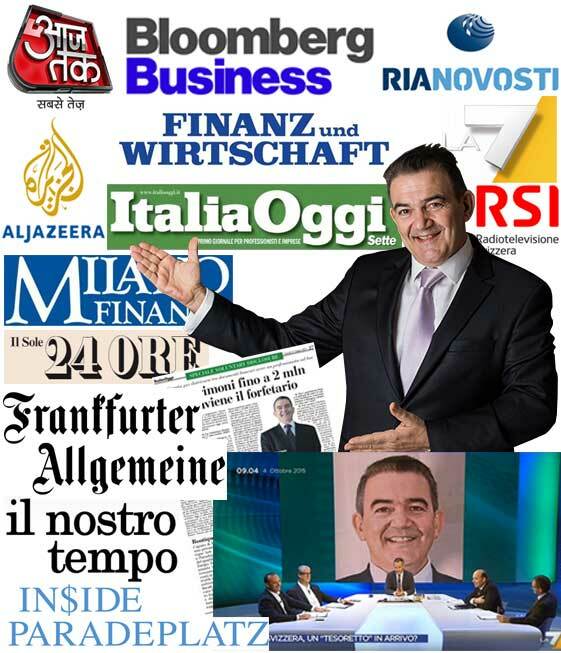 Enzo Caputo personally takes care of the needs of his international clients. With over 30 years of experience in Private Banking, he understands the concerns and needs of international private clients. Mr. Caputo speaks 5 languages. He has an exceptional global network of relationships. He is able to solve problems and reveal ways that you previously thought impossible. Names of all family members you wish moving with you to Switzerland. We will analyse your information. We will create a plan the presentation of your options. You will have a detailed consultation with Mr. Caputo via Skype, or, in the office in Zurich. All details must be clarified. If you meet all the requirements and have opted for the Lump Sum Taxation in Switzerland, you will give us a mandate in writing. Caputo & Partners submits the official application to the competent Canton. Enzo Caputo will negotiate the terms and conditions for the Tax Ruling with the Chief Tax Officer of the respective Canton. The application will be approved. We have a 100% success rate with our Applications. All of our Requests for a Lump Sum Taxation in Switzerland have been accepted so far. No Applications have been rejected so far. You have only one attempt for filing a successful Application for the Lump Sum Taxation in Switzerland with the permanent residence permit. If the Application will be rejected, the opportunity will be lost for life! What will be the benefit out of the Lump Sum Taxation if you negotiate a bad deal? This tax deal is valid for life! Do not abandon the tax deal of your life into unprofessional hands. It can cost you a fortune. The Lump Sum Taxation will open a new chapter in your life, do not compromise it. Make sure that you and your family will have monetary benefits for a lifetime.